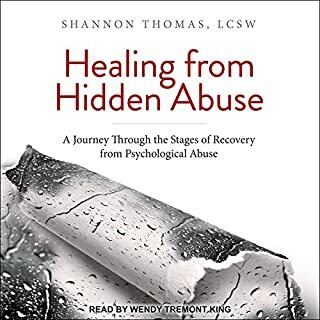 This book is well written and I like the fact that the author not only knows what she’s talking about but unfortunately, she has lived through and survived one of the horrible experiences she writes about. Her empathy for others is felt throughout the entire book. I believe she poured her heart and knowledge into writing this book and honestly it’s a God-send. This is the first book I’ve read on this subject that addresses how there are in fact people in church that are narcissists/sociopaths/psychopaths. Ms. Thomas outlines steps to healing that are definitely doable. She also addresses the fact that sometimes people do feel the sadness of what they’ve experienced. It’s not written in a hey-just-read-my-book and you’ll instantly live happily-ever-after fashion. Also, she lists key points that let you know when you’ve “achieved” certain steps. I really liked Ms. King as narrator. She has a warm and comforting voice and reminded me of a caring aunt or sincere friend. She didn’t rush through the words and really communicated the authors mood and inflections. I hope everyone enjoys this book as much as I have. I’m planning a re-read soon!